Debbie Ford is a New York Times #1 bestselling author, internationally acclaimed workshop leader, and trainer, who is committed to the evolution of human consciousness. Best known for her groundbreaking work known as the Shadow Process, Debbie works with over 10,000 people annually through her workshops and tele-seminars. 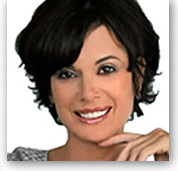 She has been featured on Oprah, Good Morning America, and recently as the expert coach on ABC's Ex-Wives' Club. Debbie founded the Ford Institute for Integrative Coaching at John F. Kennedy University, which offers professional coaching programs. And she hosts a weekly radio program on HayHouse Radio.